Product #1122 | SKU 2-038-0002 | 0.0 (no ratings yet) Thanks for your rating! Redrock Micro's microPod Accessory Plate is used to add a variety of accessories to your camera's 15 mm rod support system. Comprised of a cheeseplate, microClamp and accessory bracket, the plate attaches to your microPod or microPowerPod via 15 mm rod clamps. 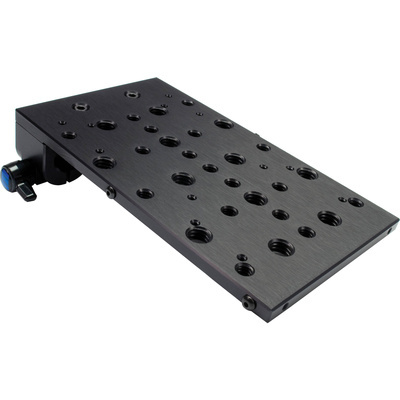 Its 17 1/4"-20 and 12 3/8" mounting holes allow the use of accessories such as articulating arms, external monitors or digital storage systems, while the accessory plate lets you mount a wireless mic receiver on the back or sides. A V-mount or Anton Bauer battery plate can also be added.